This hotel has the highest repeat visit rate of any of our group and, over the last decade with us, has had a perfect guest satisfaction record. No joke. Now, allow us to tell you about it… Few footprints on the long, sugary beach attest to this villa´s seclusion. 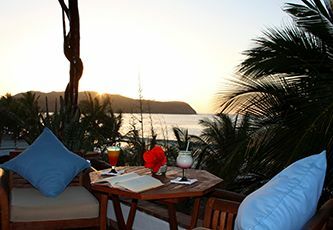 Delightfully private with impeccably personalized service, this small hideaway serves a delicious all-inclusive menu, boasts romantic ocean-view accommodations and is ideal for those seeking relaxation, pampering details and complete privacy. 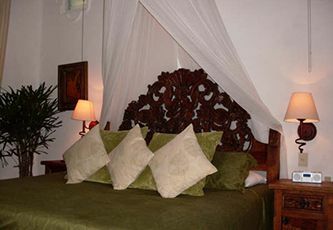 The intimate villa-style Casa de Mita (formerly known as Casa Las Brisas) has 6 guestrooms and 2 spacious suites, overlooking one of the area´s most beautiful and pristine beaches. 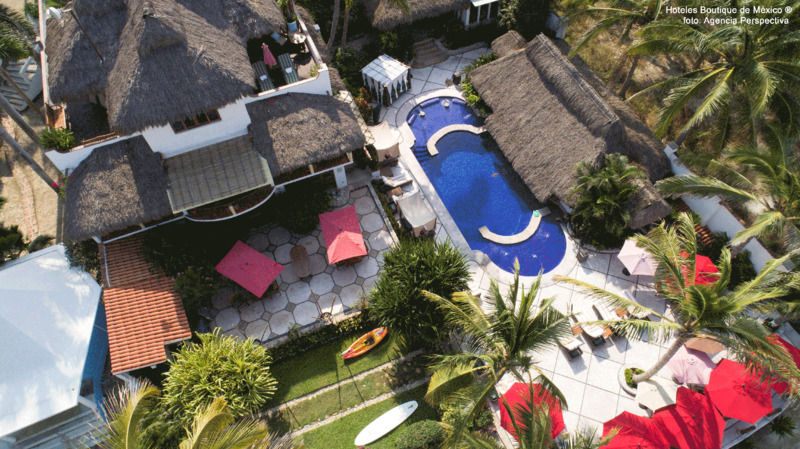 Located just 40 minutes north of Puerto Vallarta (in Punta de Mita) on the outside flank of Bay of Banderas, the scarce footprints on the long, sugary white shores attest to the hotel´s seclusion. 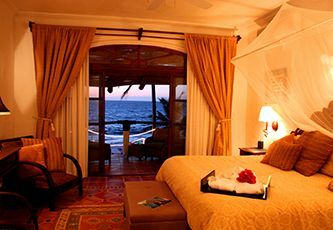 Guest rooms have breathtaking ocean views and are situated within steps of the pool and beach. Your private thatched covered balcony is a perfect oasis for morning coffee while you contemplate the delights of the day. Sun drenched patios, palm shaded lounge areas and intimate canopied daybeds beckon for a lazy afternoon read from the lending library, a tropical cocktail or a breeze kissed siesta. Unique interiors are detailed and elegant, with imposing hand carved furniture and architectural touches that effortlessly lend to the simplistic elegance of this exclusive retreat. 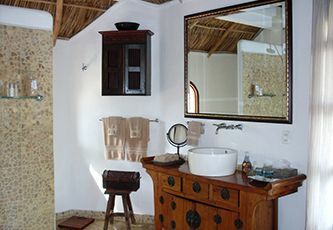 The spacious bathrooms are a fiesta in themselves, with immense showers lined with hand painted tiles and natural stone mosaics. The attentive yet unobtrusive service of the staff redefines hospitality and graciousness, and is undoubtedly the highlight of your stay. A passion for fine cuisine makes Casa de Mita one resort where guests welcome the formula of “all inclusive´´ so much so that this feature can be deemed “exclusive inclusivity". Activities center around the privileged natural setting. And if doing nothing at all is what you choose, your hosts are experts at making that pleasure, an art! 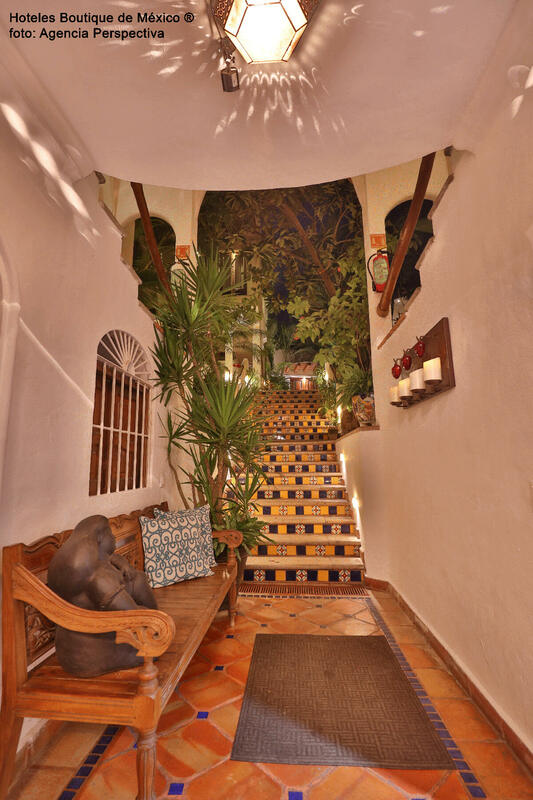 After a few fabulously relaxing nights at Casa de Mita, head to downtown Puerto Vallarta. Guests planning longer stays can also drive to exciting Guadalajara and discover the urban oasis. The feeling of being at your own private beach house and the hundreds of books that are scattered throughout the property. The oceanfront daybeds are also a fantastic amenity. There are daily flights from Puerto Vallarta to the city of Guadalajara (or first-class buses through ETN.com.mx), making it easy and inexpensive to plan a sun & sight-seeing Mexico adventure. Margaritas and mariachis – the best of both worlds! The staff!! 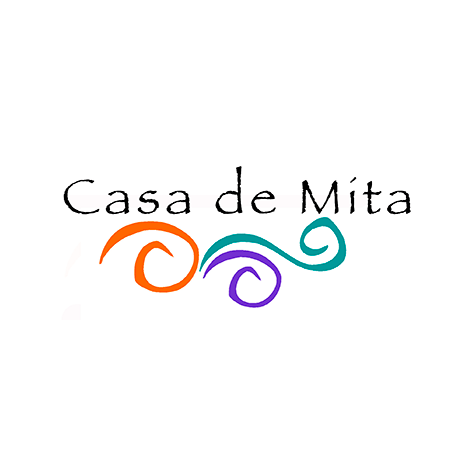 Casa de Mita boasts the most attentive yet unobtrusive staff imaginable. Intuitive, polite and accommodating. The epitomy of mexican hospitality. Those who love quiet, casual relaxation. The hotel is perfect for reading, soft conversation, afternoon naps and sipping your favorite cocktail over a lingering sunset. One king beds. Lower floor. All with balcony. One king bed. Upper floor all with balcony. Two queen beds. Upper floor with balcony. Spacious accommodations with king bed, sitting area and balcony. 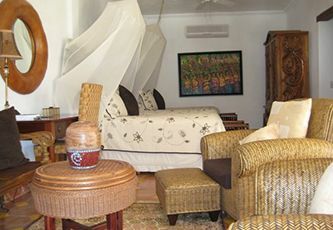 Spacious accommodations with king bed, full bathroom,living room, kitchen, palapa-thatched patio with spectacular ocean view. All Year 1. No penalty will be charged for cancellations received 60 days or more prior to arrival date (except for multiple room reservations, 3 nights plus taxes) 2. Cancellations received less than 60 days prior to arrival date will be charged 50% of the entire stay. 3. Less than 30 days prior will be charged 100%. 4. Every attempt will be made to re-sell your reservation and any success will be credited to your cancellation charge. Holidays 1. All deposits and payments for Holiday reservations are non-refundable. 2. Every attempt will be made to re-sell your reservation and any success will be credited to your cancellation charge. Please note that multiple room (3+) reservations (is considered a group and would be designated as such at the time of reservation) cannot be cancelled, they are only re-sellable. This applies whether one person is paying for the whole group or even in the case that one person puts rooms on hold for each guest to then make their own formal booking. All meals. Selection of non-alcoholic and alcoholic beverages. Round trip airport transportation is included in reservations of 5 nights or more. 19% tax not included. Gratuity for staff at guest´s discretion. Single rates available $70 USD off regular rate. Maximum room occupancy: two. Additional beds not available. Please inquire about multiple room bookings and complete villa rental. Not suitable for children. Please inquire about child and pet policies. Three-night minimum stay required, during the Summer the minimum stay is of 2 nights (May thru Oct, 2012). Single night stays will be charged an additional $75 USD per night. Minimum stays apply as follows: Christmas (seven nights) arrival any day in December, departure Dec. 27. New Year: (seven nights) arrival Dec. 27. Both Christmas and New Year: 14 nights, arrival and departure dates of your choice. For stays of 5 nights or more, the hotel includes complimentary VIP round transportation from Puerto Vallarta´s airport with prior notice. The trip is approximately 45 minutes. For stays of one to four nights, round-trip transportation costs are additional. Please provide your airline, flight number, estimated arrival time and point of origin. Six courses to choose from! Golf is becoming a way of life on the Mexican Riviera. Picture teeing off in the tropical breezes of Banderas Bay or the Pacific Ocean, courses lined with palm trees and vibrant tropical flowers, personal bilingual caddies and beautiful clubhouses with open-air dining and views of the greens.Think of pro shops equipped with everything you need or want and state-of-the-art courses that offer an optional 19th hole on an island. Condo-side courses, beachside courses, resort courses, private courses, public courses are what make golf in Puerto Vallarta. Located in Marina Vallarta, since most of the fairways are lined with palm trees and guarded by water, a premium is placed on accuracy. Located in Nuevo Vallarta, this traditional-style course enjoys the reputation of being the easiest to play because of its wide-open fairways. Located 30 minutes north, this course has eight picturesque holes bordering the ocean. Hole #3, called the “Tail of the Whale,” is a 194-yard, par 3 that plays across the ocean to a rocky island green. Located in Nuevo Vallarta, this is a fun course, though bunkers and water hazards are everywhere. The #14 signature hole is a beautiful 166-yard, par 3 with the ocean on the left and a lake on the right. Located in Nuevo Vallarta, this is a lengthy course protected by traps and water throughout. The mammoth finishing hole is the par 5, 621-yard “Tiger.” Most golfers find it untamable because water runs all the way down the left side and the multi-tiered green is surrounded by sand. This is actually two spectacular golf courses at one location, just 10 minutes east of the airport. The Nicklaus course has garnered worldwide recognition since hosting the 2002 EMC World Cup Championship, and the Weiskopf course is equally outstanding. Both have generous landing areas on the fairways, but the undulating greens can be tortuous. Experience the ultimate in luxury as two massage-therapists work in perfect harmony to vanquish your body´s muscular tension. Four hands will synchronize to create a truly unique relaxing treatment that will rejuvenate your body and mind. Techniques of therapeutic massage are utilized in this treatment. This provides a deep, warm and nurturing massage that is applied with warm river stones. The benefits of this multi-faceted technique go beyond measure. Physiological improvements include an increase in energy and relief of inflamed muscles. Take a deep breath and let´s begin. “Shiatsu” is a Japanese word meaning “finger pressure.” This pressure point massage balances and restores the flow of energy throughout the body. Shiatsu is a new name for one of the oldest forms of medicine, healing with the hands, and rekindles the natural ability that people have of responding to touch. This massage is a combination of many therapeutic techniques including: aromatherapy, acupressure, deep tissue, and Swedish massage. These techniques are all combined to maintain balance and harmony within mind and body. Enjoy and relax while this stimulating massage improves blood circulation and invigorates the senses. This Swedish technique applies rhythmic strokes to the entire body and incorporates the use of fragrant essential oils. Captured within this special “mud” is an extremely high concentration of minerals, scientifically proven to be essential in maintaining healthy skin. Mineral mud works deep to clean, purify and restore the skin´s natural moisture balance, leaving it smooth, radiant and revitalized. This treatment also utilizes a gentle exfoliant as well as intense moisturizers to hydrate and heal your skin. The result: a more vibrant, supple skin tone revealed all over your body. Immerse your body in the luxurious lather of a mineral-enriched gel. Then, a natural cleansing agent rich in moisturizing minerals will gently lift away impurities and worn-out cells. Moisturizers rich in aloe will wrap your body in silky softness all day long. This treatment deeply cleanses and nourishes your complexion to give your face a vibrant tone. It will restore your skin´s pH balance, replenish its moisture level and infuse your complexion freshness and youthful splendor. This treatment is enriched with anti-bacterial tea-tree oil and other natural plant derivatives to make splits and dryness disappear. Enjoy a smoother, revitalized surface on your legs and feet while preventing further chapping and cracking. Experience restored vitality for supple, softer and younger looking hands. A complex containing green tea extract and vitamin E will nourish, hydrate and smooth the delicate skin of the hands. The ancient art of yoga has been practiced for more than 5000 years and originated in India. The word “yoga” means “to unite” and it is the unification of mind, body, and soul that has allowed this practice to endure the centuries. Experience the world of yoga in this intimate one-on-one session as you practice physical postures (asanas), essential breathing components and meditation. This session is tailored to individual´s needs and physical ability and designed to reduce stress while promoting physical, psychological and emotional healing. Yoga Therapy is ideal for any skill level and taught by a certified yoga therapist. Elegant yet casual, with an ocean view. The menu changes daily, alternating Mexican, contemporary and international dishes favoring organic, locally grown produce, fresh-caught seafood and the finest grades of meat and poultry. All meals are included for hotel guests. Breakfast and lunch: Exclusively reserved for hotel guests. Dinner: A fixed-price menu is available for visitors; advance reservations are mandatory.